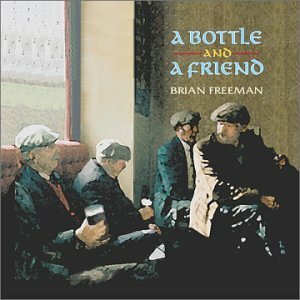 "Bottle and a Friend" is a collection of 9 traditional Scots and Irish and 5 original songs that seamlessly blend the past with the present with heart and humor. Brian performs on guitar, mandolin, tenor banjo, bodhran, whistle, autoharp, tiple and vocals, and is joined on the CD by Crystal Reeves on fiddle and viola, Steve Fain on electric and upright bass, Sam Cuenca on upright bass, and Kailey Freeman on harmony vocals. From the whimsical nature of the traditional Scottish song "The Parish Dunkeld" in which the minister's fire and brimstone sermons result in his being hung by his partitioners and replaced in the pulpit by a still and piper, to a song Brian wrote about the reconciliation with one's father, to "A Perfect World" where the twisted world is straightened somewhat when seen through lovers' eyes, to a multi-voiced choral rendition of successful courtship on the traditional Scots song "To Pad the Road with Me." Brian's arrangements and lyrics are full of vitality and new twists on familiar themes.